355 Beacon is located on the south side of Beacon, between Fairfield and Gloucester, with 353 Beacon to the east and 357 Beacon to the west. 355 Beacon was designed and built ca. 1870 by Frederick B. Pope, for speculative sale, one of a symmetrical pair of houses (353-355 Beacon). At about the same time, he also designed and built a third house at 351 Beacon. Click here for an index to the deeds for 355 Beacon. On August 23, 1870, 355 Beacon was purchased from Frederick Pope by attorney George Bancroft and his wife, Sarah G. (Farley) Bancroft. 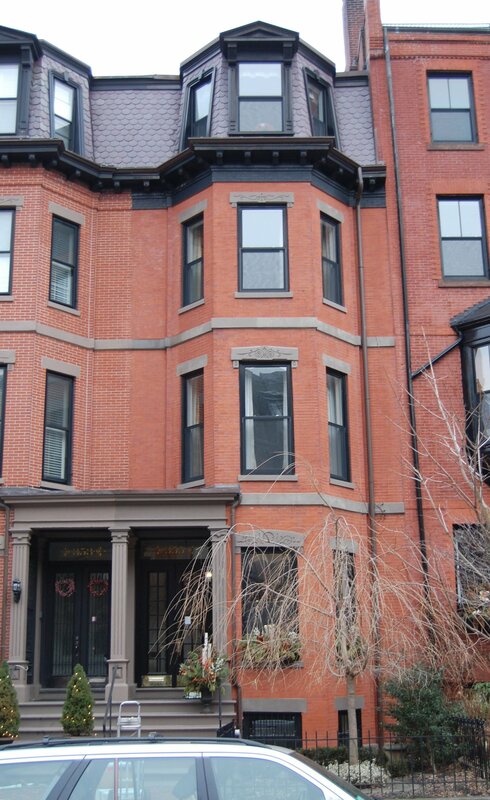 They previously had lived at 5 Shawmut Avenue. Living with them were Sarah Bancroft’s unmarried nieces, Lucy Elizabeth Phelps and Frances (Fanny) Lucretia Phelps, daughters of Dudley and Lucretia (Farley) Phelps. On March 20, 1878, George Bancroft transferred the property into Sarah Bancroft’s name. George Bancroft died in April of 1881, and Sarah Bancroft continued to live at 355 Beacon with her two nieces until her death in December of 1907. Lucy and Fanny Phelps continued to live there in 1908. In June of 1908, their brother, Dudley Farley Phelps, was living with them at the time of his death by suicide. Dudley Phelps was an attorney in New York City, where he lived with his wife, Ethel Miriam (Hart) Phelps. He had served as an assistant US attorney for the Southern District of New York and later as an official of the US Customs Service; during the Civil War, he had served as an officer with the 20th Colored infantry corps. On September 12, 1908, 355 Beacon was purchased from the estate of Sarah Bancroft by Susan (Emmons) Garfield, the wife of attorney Irvin McDowell Garfield, son of President James Garfield. 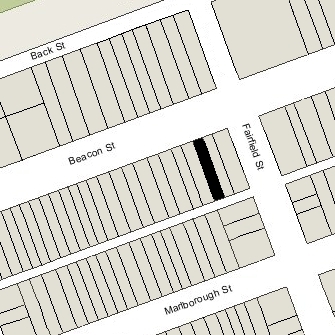 In June of 1908, when their daughter Eleanor was born, they had lived in an apartment at 409 Marlborough. 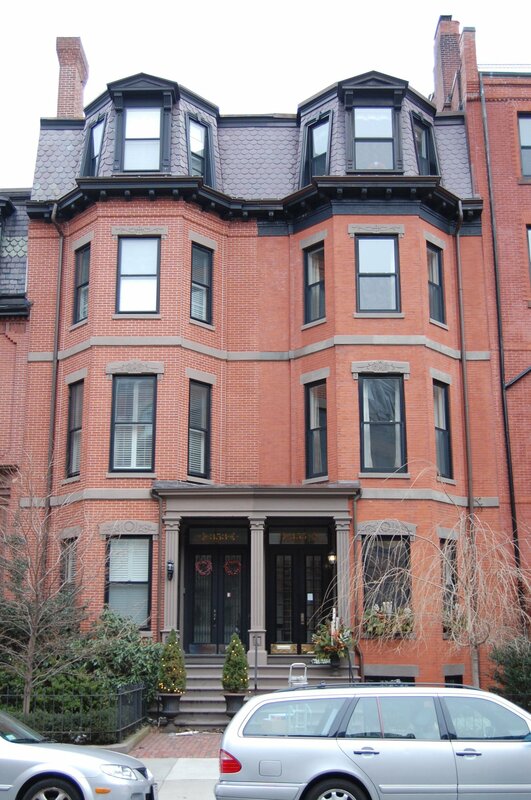 They continued to live at 355 Beacon in 1910; but had moved to 127 Marlborough by 1911. 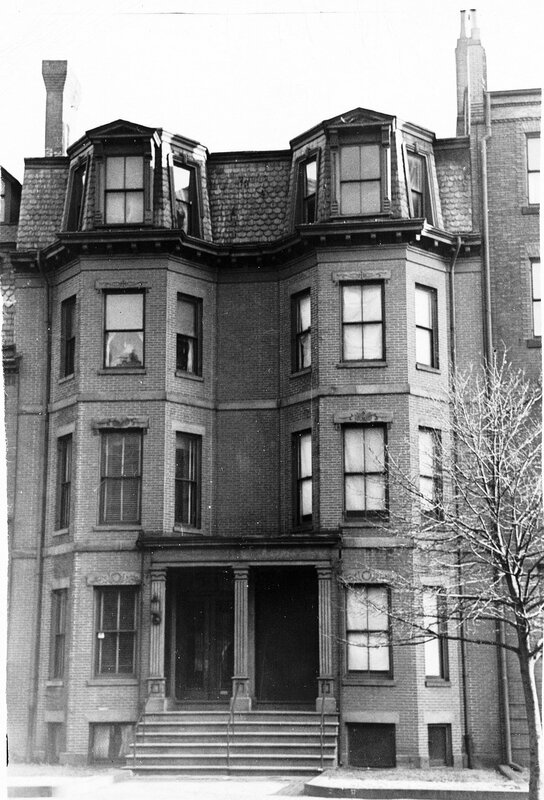 During the 1910-1911 winter season, 355 Beacon was the home of Dr. James Gregory Mumford, a physician and professor at Harvard Medical School, and his wife Helen S. (Ford) Mumford. They previously had lived in an apartment at Haddon Hall at 282 Berkeley, where he continued to maintain his office. By 1912, they lived in Centre Harbor, New Hampshire. By the 1911-1912 winter seasons, 355 Beacon was the home of Frederic William Atherton and his wife, Ellen Maud (Tilton) Atherton. They had been married in April of 1911, and 355 Beacon probably was their first home together. Prior to their marriage, he had lived at 144 Commonwealth with his mother, Mary Edwards (Dwight) Atherton, the widow of William Atherton. Frederic Atherton was trustee of his family’s interests and one of three trustees named to administer the portion of the Estate of Arioch Wentworth designated for the establishment of the Wentworth Institute. Frederic and Ellen Atherton subsequently moved to Washington DC. His mother died in March of 1915, and by the 1915-1916 winter season, they were living at 144 Commonwealth. During the 1912-1913 winter season, 355 Beacon was the home of wholesale cotton merchant John Silsbee Lawrence and his wife, Emma (Atherton) Lawrence, Frederic Atherton’s first cousin, once removed. They previously had lived at 96 Bay State Road. In August of 1913 they acquired and subsequently moved to 59 Commonwealth. On December 16, 1913, 355 Beacon was purchased from Susan Garfield by Miss Edith Bangs. She previously had lived at 419 Beacon. She continued to live at 355 Beacon until about 1934, but spent the 1932-1933 winter season at an apartment at 186 Commonwealth, and traveled to Europe during the 1933-1934 season. By the 1935-1936 season, she had moved to an apartment at 256 Beacon. On November 7, 1935, 355 Beacon was purchased from Edith Bangs by Louise (Clark) Fort, the wife of Dr. Rufus Elijah Fort. Rufus and Louise Fort lived in Nashville, where he was vice president and medical director of an insurance company. 355 Beacon was not listed in the Blue Books for 1935-1937 nor in the 1935-1946 Lists of Residents, and was shown as vacant in the 1935-1946 City Directories. On December 14, 1945, 355 Beacon was purchased from Louise Fort by William John Anderson, Jr., an investment counselor, and his wife, Helen (White) Thibodeau Anderson. In February of 1947, Helen Anderson applied for permission to install a fire escape on the rear of the building, indicating that the proposed use would remain as a single-family dwelling. She subsequently abandoned the permit. In August of 1955, William Anderson, Jr., applied for permission to convert the property from a single-family dwelling into a single-family dwelling and business office for “applied psychology of perceptual science.” The application was denied and his appeal of the denial was dismissed by the Board of Appeal. On September 7, 1955, 355 Beacon was acquired from the Andersons by Barclay Harding Warburton. Barclay Warburton was a member of the Massachusetts House of Representatives from Ipswich. On September 15, 1955, 355 Beacon was acquired from Barclay Warburton by Ann Sutton Nichols. In January of 1956, she applied for the same permission previously denied to William Anderson, Jr.: to convert the property from a single-family dwelling into a single family dwelling and business office for “applied psychology of perceptual science.” The application was once again denied and her appeal of the denial was dismissed by the Board of Appeal. She continued to live at 355 Beacon in 1968, and probably later. On August 18, 1981, Charles Howard Davis and his wife, Libra (Libera) Vigliaroli (Roli) Davis, purchased 355 Beacon from Ann Nichols. They made it their home. Charles Davis died in May of 1987. On June 8, 1999, 355 Beacon was purchased from Libra Davis by Valerie Swett and Richard D. Bickelman, trustees of Rothermere Realty Trust.